Bread Pakoras recipe by Za at DesiRecipes.com. 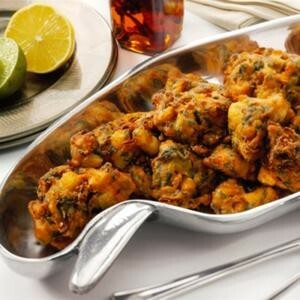 Bread Pakora is a tasty and luscious snack which is very easy and simple to prepare. Remove the crust from bread and crumble into small pieces. Then soak it in curd and 1/2 cup of water. Now take gram flour and add all the ingredients and mix them well with bread crumbs. Drop a spoonful of material in oil and deep fry. Serve hot with any sauce of your choice. There are 12 comment(s) for this recipe. what if i dont have baking powder?